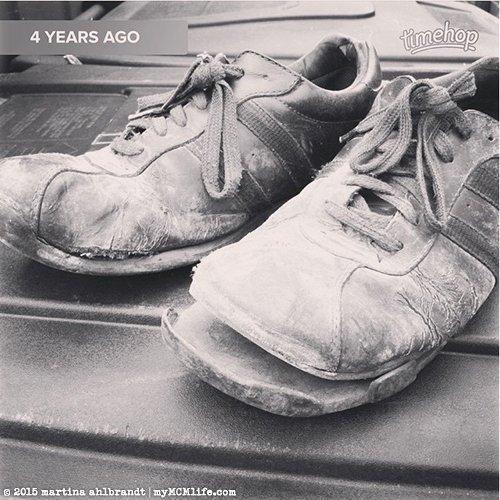 Four years ago, I took a picture of Jason’s old shoes before throwing them away. I wanted to remember what they looked like because they represented so much to me. As disgusting as they were, I was a little sad to say goodbye. First, they show that my husband is so thrifty that he’ll wear his shoes until they’re completely falling apart and his wife insists on throwing them away. More than anything though, they represent hard work. He’s spent the past 20 years playing the heck out of guitars, fine tuning his gift. These shoes took him to school and band rehearsals and shows at first. But these shoes also worked for five years at Starbucks when we first moved to Nashville and were chasing hard after our dreams. Jason worked two or three jobs at a time while I finished my graphic design degree. After the barista days, these shoes spent many, many hours doing yard work and home renovations, building tons of sweat equity into our first two homes. He works harder than anyone I know taking care of his family, our home and his career. Jason Ahlbrandt, thank you for doing all that you do for us. I could not be any more proud of you. I’m so glad I get to be your one and only. This entry was posted on Monday, August 17th, 2015 at 7:00 am and is filed under Family, Family: Jason. You can follow any responses to this entry through the RSS 2.0 feed. You can skip to the end and leave a response. Pinging is currently not allowed.